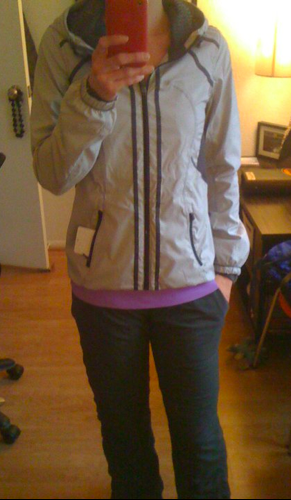 A lovely person was kind enough to share pictures on Facebook of her new Downtime Jacket. The jacket is priced at $145 and is a ‘track’ jacket and not necessarily a running jacket. I think what makes it not a running jacket is the lack of reflective detailing but other then that I don’t see why you couldn’t use it for running in. This is a spring weight jacket with Gradient Mesh liner which makes this a cooler jacket then ones like Hustle Jacket, Inspire Jacket and Outward Bound which are lined with coolmax. Lined track jacket designed to take you to & from your early morning spring runs!